The Hybrid Metal Figuration Action Figure comes with a light-up base! Includes an EE-3 rifle, detailed weathered armor and dented helmet, and interchangeable hands. Die-cast metal body gives the Mandalorian robust and firm articulation. Hero Cross' most-anticipated addition to its Star Wars lineup, Boba Fett sports a traditional HMF die-cast metal body, giving the notorious Mandalorian bounty hunter robust and firm articulation. 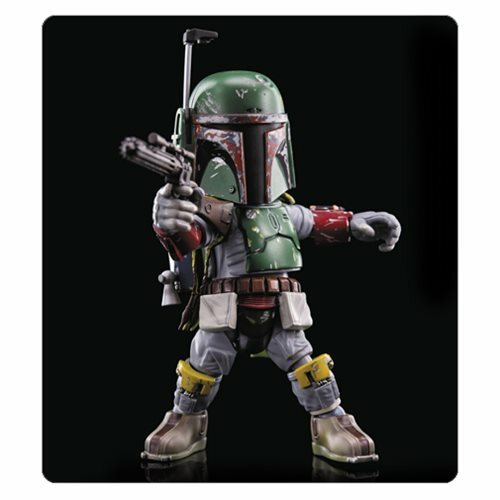 Complete with an EE-3 carbine rifle, highly detailed weathered armor and dented helmet, and 6 interchangeable gloved hands, this Star Wars Boba Fett Hybrid Metal Figuration Action Figure even comes with a light-up base for display! Ages 15 and up.